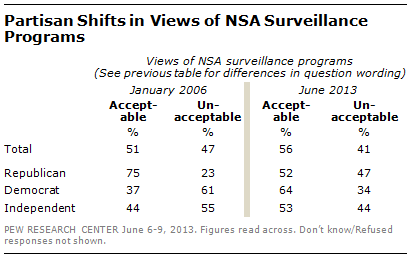 That chart from a Pew Research Poll about the recent NSA leaks shows that people often pivot based on partisanship rather than principle. I find it not only maddening to arriving at some semblance of the truth, but sickening as a detriment to doing that which is morally right. Why is this? Why is this issue being met with a shrug of the shoulders and a passing interest? It’s very troubling to me.